William Simpson & Associates Inc.
Dodger Stadium, occasionally called by the metonym Chavez Ravine, is a baseball park located in the Elysian Park neighborhood of Los Angeles, California, the home field to the Los Angeles Dodgers, the city's National League franchise of Major League Baseball (MLB). Opened 57 years ago on April 10, 1962, it was constructed in less than three years at a cost of US$23 million, financed by private sources. 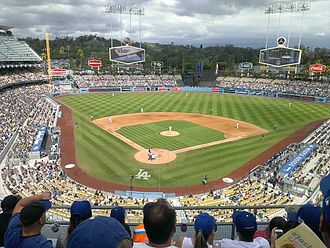 Dodger Stadium is currently the oldest ballpark in MLB west of the Mississippi River, and third-oldest overall, after Fenway Park in Boston (1912) and Wrigley Field in Chicago (1914) and is the world's largest baseball stadium by seat capacity. Often referred to as a "pitcher's ballpark", the stadium has seen twelve no-hitters, two of which were perfect games. The stadium hosted the Major League Baseball All-Star Game in 1980 - and will host in 2020 - as well as games of 10 World Series (1963, 1965, 1966, 1974, 1977, 1978, 1981, 1988, 2017, and 2018). It also hosted the semifinals and finals of the 2009 and 2017 World Baseball Classics. It also hosted exhibition baseball during the 1984 Summer Olympics. It will also host baseball and softball during the 2028 Summer Olympics. The stadium hosted a soccer tournament on August 3, 2013 featuring four clubs, the hometown team Los Angeles Galaxy, and Europe's Real Madrid, Everton, and Juventus. For the first time at Dodger Stadium, the Los Angeles Kings and Anaheim Ducks played a regular season game on January 25, 2014 as part of the NHL Stadium Series. 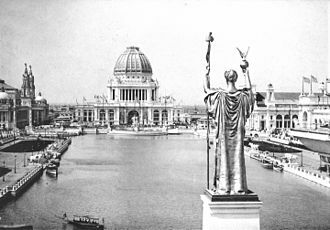 In the mid-1950s, Brooklyn Dodgers team president Walter O'Malley had tried to build a domed stadium in the New York City borough of Brooklyn, but was unable to reach an agreement with city officials for the land acquisition, and eventually reached a deal with the city of Los Angeles. The land for Dodger Stadium was seized from local owners and inhabitants in the early 1950s by the city of Los Angeles using eminent domain with funds from the Federal Housing Act of 1949. The city had planned to develop the Elysian Park Heights public housing project, which included two dozen 13-story buildings and more than 160 two-story townhouses, in addition to newly rebuilt playgrounds and schools, and a college. Before construction could begin on the housing project, the local political climate changed greatly when Norris Poulson was elected mayor of Los Angeles in 1953. 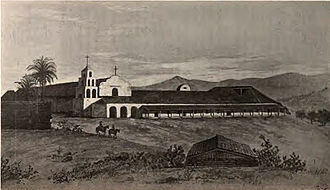 Proposed public housing projects such as Elysian Park Heights lost most of their support as they became associated with socialist ideals. 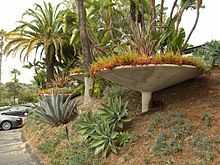 Following protracted negotiations, the city purchased the Chavez Ravine property back from the Federal Housing Authority at a drastically reduced price, with the stipulation that the land be used for a public purpose. It was not until June 3, 1958, when Los Angeles voters approved a "Taxpayers Committee for Yes on Baseball" referendum, that the Dodgers were able to acquire 352 acres (1.42 km2) of Chavez Ravine from the city. 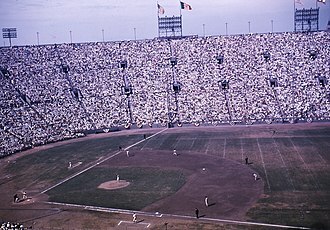 While Dodger Stadium was under construction, the Dodgers played in the league's largest capacity venue from 1958 through 1961 at their temporary home, the Los Angeles Memorial Coliseum, which could seat in excess of 90,000 people. Los Angeles-based Mike Davis, in his seminal work on the city, City of Quartz, describes the process of gradually convincing Chavez Ravine homeowners to sell. With nearly all of the original Spanish-speaking homeowners initially unwilling to sell, developers resorted to offering immediate cash payments, distributed through their Spanish-speaking agents. Once the first sales had been completed, remaining homeowners were offered increasingly lesser amounts of money, to create a community panic of not receiving fair compensation, or of being left as one of the few holdouts. Many residents continued to hold out despite the pressure being placed upon them by developers, resulting in the Battle of Chavez Ravine, a ten-year struggle by the residents to maintain control of their property, which they ultimately lost. Dodger Stadium was the first Major League Baseball stadium since the initial construction of the original Yankee Stadium to be built using 100% private financing, and the last until Oracle Park in San Francisco opened in 2000. Ground was broken for Dodger Stadium on September 17, 1959. The top of local ridges were removed and the soil was used to fill in Sulfur and Cemetery Ravines to provide a level surface for a parking lot and the stadium. A local elementary school (Palo Verde) was simply buried and sits beneath the parking lot northwest of third base. A total of 8 million cubic yards of earth were moved in the process of building the stadium. 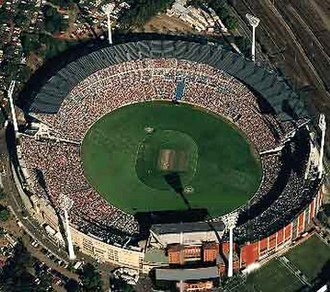 21,000 precast concrete units, some weighing as much as 32 tons, were fabricated onsite and lowered into place with a specially built crane to form the stadium's structural framework. The stadium was originally designed to be expandable to 85,000 seats by expanding the upper decks over the outfield pavilions; the Dodgers have never pursued such a project. Dodger Stadium was also the home of the Los Angeles Angels from 1962 through 1965. To avoid constantly referring to their landlords, the Angels called the park Chavez Ravine Stadium (or just "Chavez Ravine"), after the geographic feature in which the stadium sits. Dodger Stadium seat removal, 2005 offseason. At the conclusion of the 2005 season, the Los Angeles Dodgers made major renovations during the subsequent off-season. The largest of these improvements was the replacement of nearly all the seats in the stadium. The seats that were removed had been in use since 1975 and helped give the stadium its unique "space age" feel with a color palette of bright yellow, orange, blue, and red. The new seats are in the original (more muted) 1962 color scheme consisting of yellow, light orange, turquoise, and sky blue. 2,000 pairs of seats were made available for purchase at $250, with the proceeds going to charity. The baseline seating sections have been converted into retro-style "box" seating, adding leg room and a table. Other repairs were made to the concrete structure of the stadium. These improvements mark the second phase of a multi-year improvement plan for Dodger Stadium. Between 2003 and 2005, Dodger Stadium upgraded with LED video displays. The large main video display measures 27 feet high by 47 feet wide. Dodger Way – A tree-lined entrance will lead to a landscaped grand plaza where fans can gather beyond center field. The plaza will connect to a promenade that features restaurants, shops and the Dodger Experience museum showcasing the history of the Dodgers in an interactive setting. Green Necklace – The vibrant street setting of Dodger Way links to a beautiful perimeter around Dodger Stadium, enabling fans to walk around the park, outdoors yet inside the stadium gates. This Green Necklace will transform acres of parking lots into a landscaped outdoor walkway connecting the plaza and promenade to the rest of the ballpark. Top of the Park – The Green Necklace connects to a large scale outdoor plaza featuring breathtaking 360° views spanning the downtown skyline and Santa Monica Bay, the Santa Monica and San Gabriel Mountains, and the Dodger Stadium diamond. 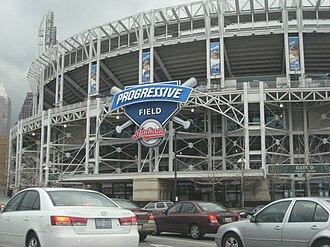 In the 2008–2009 offseason, the upper levels of the stadium were supposed to be renovated to match the repairs and improvements made to the field level. The improvements were to include the removal of the trough urinals in the men's restrooms, new concession stands and earthquake retrofitting to the concrete structure. It was also to include the replacement of the outfield scoreboards and monitors with new HD monitors. Due to the 2009 World Baseball Classic hosted at Dodger Stadium, these renovations were put on hold. The divorce of Frank and Jamie McCourt, as well as a weak economy, were the reasons for the postponement. To pay for an outstanding loan with the Dodgers former owner News Corporation, former owner Frank McCourt used Dodger Stadium as collateral to obtain a $250 million loan. 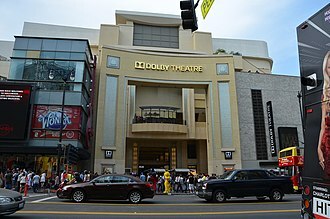 In 2008, the Los Angeles City Council voted unanimously to give the Dodger Stadium area bounded by Academy Rd, Lookout Dr. and Stadium Way its own zip code, 90090 (as of July 2009). This also gives the area a new name, Dodgertown. The signs from the former Dodgertown spring training facility in Vero Beach, Florida will likely be integrated into the $500 million project. 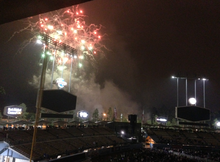 Dodger Stadium during a postgame "fireworks night" promotion. Notice the new HD screens in place of the old rectangular video board and scoreboard. Tommy Lasorda's Trattoria, an Italian restaurant in the right field concourse at Dodger Stadium. The restaurant is a product of the minor 2014 renovations to Dodger Stadium. Following the sale of the Dodgers in 2012, the team brought in the architect, urban planner, and stadium specialist Janet Marie Smith to lead renovations efforts to the 50-year-old stadium. Renovations to Dodger Stadium began in the winter of 2012. Both video boards were replaced with High Definition screens, and new clubhouses and weight rooms were installed. The restrooms, concession stands, sound system and batting cages were also improved and renovated. Dodgers owner Guggenheim Partners internally discussed moving the Dodgers to a new stadium at a Downtown Los Angeles site proposed by the Anschutz Entertainment Group to allow an NFL team to build a stadium at the Dodger Stadium site. Guggenheim Partners also considered allowing an NFL team to build a stadium next to Dodger Stadium. The NFL eventually chose to build a stadium in the City of Inglewood. The extensive renovations to Dodger Stadium were ready for the 2013 season and included new HD hexagonal video and scoreboards, a new sound system, wider concourses, more standing room viewing areas, improved restrooms and a children's playground amongst others. Between the 2013 and 2014 seasons, more renovations were put in place. Dodger Stadium was the beneficiary of improvements such as wider concourses in the pavilions, new restaurants "Think Blue Bar-B-Que" and "Tommy Lasorda's Trattoria", dedicated team store buildings replacing the tents that previously served as team stores, bullpen overlooks with overlook bars, and tree relocation at the top of the stadium. Dodger Stadium was one of the last baseball-only facilities built before the dawn of the multi-purpose stadium. 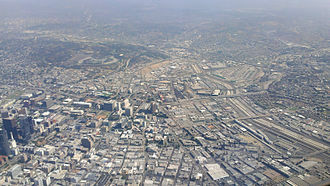 It was built near the convergence of several freeways near downtown Los Angeles, with an expansive parking lot surrounding the stadium. With the construction of many new MLB ballparks in recent years, it is now the third-oldest park still in use, and the oldest on the West Coast. Dodger Stadium offered several innovative design features. One of these was a covered and screened section of dugout-level seats behind home plate. Dodger owner Walter O'Malley was inspired to incorporate this feature into the Dodger Stadium design after having seen it at Tokyo's Korakuen Stadium during the Brooklyn Dodgers' postseason goodwill tour of Japan in 1956. The original dugout seating area was replaced by more conventional box seating in a 1999 renovation, but this feature has been replicated at Progressive Field in Cleveland and Angel Stadium of Anaheim. Two of Dodger Stadium's most distinctive features are the wavy roof atop each outfield pavilion and the top of a 10-story elevator shaft bearing the Dodger logo rising directly behind home plate at the top of the uppermost seating level. A unique terraced-earthworks parking lot was built behind the main stands, allowing ticketholders to park at roughly the level of their seats, minimizing use of ramps once inside. 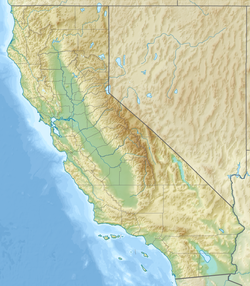 The stadium was also designed to be earthquake-resistant, an important consideration in California, and it has withstood several serious earthquakes. Dodger Stadium was originally equipped with two large Fair Play electronic scoreboard units above the left- and right-field pavilions. The right-field board displayed in-game information. The left-field board displayed scores of out-of-town games and other messages. Smaller auxiliary scoreboards were installed at field level on the box seat fences beyond the first- and third-base dugouts during the inaugural 1962 season. The left-field message board was replaced by a Mitsubishi Electric Diamond Vision video board in 1980. The field-level auxiliary scoreboards were replaced by larger units installed on the facade of the Loge (second) seating level in 1998; these, in turn, were replaced by a video ribbon board in 2006. Field-level out-of-town scoreboards were installed on the left- and right-field walls in 2003. Strobe lights were added in 2001; they flash when the Dodgers take the field, after a Dodger home run, and after a Dodger win. In addition to those of Don Drysdale, Sandy Koufax, and Don Sutton, the retired numbers of Pee Wee Reese, Jackie Robinson, Duke Snider, Tommy Lasorda, Walter Alston, Roy Campanella and Jim Gilliam are mounted on the club level facade near the left field foul pole. On April 15, 2017, to mark the 70th anniversary of Robinson's major league debut, the Dodgers unveiled a bronze statue of the player in the stadium's left-field plaza. The 800-pound sculpture depicts Robinson sliding into home plate as a rookie. The Dodgers devote significant resources to the park's maintenance. For example, it is repainted every year, and a full-time crew of gardeners maintain the site. 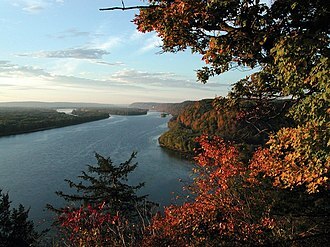 As a result, it has stood the test of time very well, and no plans are in the works to replace it. 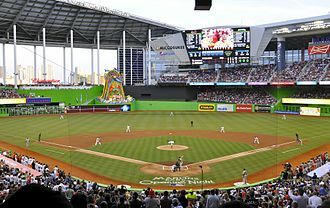 Renovations were made in 1999 and again in 2004 that initially added additional field level seats, particularly behind home plate where previously the only person seen there was legendary scout Mike Brito, in his trademark Panama hat and cuban cigar tracking pitch speeds with a radar gun. After some criticism of the sightlines with these new seats, they were replaced with box seats. 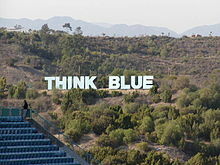 The former Think Blue sign in the mountains north of Dodger Stadium, was an homage to the nearby Hollywood Sign. In order to comply with a conditional-use permit limiting Dodger Stadium's seating capacity to 56,000 it was the only current MLB park (through 2005 ) that had never increased its capacity. Whenever higher revenue lower seats were added some in the upper deck or pavilion were removed to keep the number the same. Through the sale of standing room only tickets, the Dodgers' 2009 home opener drew 57,099 fans, the largest crowd in stadium history. Following a number of incidents in the early 1970s in which fans showered Cincinnati Reds left fielder Pete Rose with beer, bottles, cups, and trash, the sale of beer was discontinued in both pavilions. 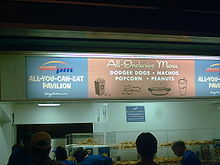 Beer sales were reinstated in the right field pavilion in 2008, when that section was converted into the All You Can Eat Pavilion. Fans seated in that section can eat unlimited hot dogs and peanuts and also have access to free soft drinks. There is a charge for beer. 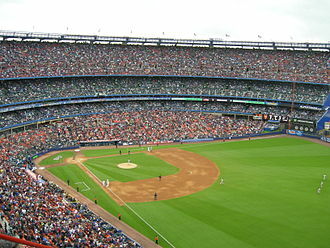 With the retirement of the original Yankee Stadium and Shea Stadium in 2008, the park reigned as the largest capacity ballpark in the Majors. As of 2010, there are a total of 2,098 club seats and 68 luxury suites. Both of these amounts will increase once the renovations are complete, with the necessary offset to comply with its conditional-use permit. Due to renovations made in the 2012–2013 offseason, the current maximum capacity of Dodger Stadium is less than 56,000, although the team's president, Stan Kasten, refuses to provide an exact number. A 53,393 attendance is considered a sellout. The high water mark since the renovations is 56,800 in Games 3,4 and 5 of the 2008 NLDS. The team's 2013 media guide and website still report the capacity as 56,000. The record attendance for the Dodgers was in the 2007 season, with 3.86 million in total attendance. 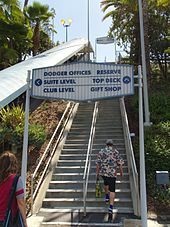 For various reasons, Dodger Stadium has long enjoyed a reputation as a pitchers' park. At first, the relatively deep outfield dimensions were a factor, with the power alleys being about 380 feet. Home plate was moved 10 feet toward center field in 1969, but that move also expanded foul ground by 10 feet, a tradeoff which helped to offset the increased likelihood of home runs caused by the decreased field dimensions. Also, during evening games, as the sun sets, the surrounding air cools quickly due to the ocean climate, becoming more dense. As a result, deep fly balls that might otherwise be home runs during the day instead often remain in play becoming outs. The park has been home to 12 no-hitters, while players have hit for the cycle just twice in Dodger Stadium. Recently, Dodger Stadium has been more neutral with respect to home runs. The stadium does depress doubles and triples quite a bit, due to its uniform outfield walls and relatively small "corners" near the foul poles. However, the extremely short outfield walls near the foul poles also make some balls that would bounce off the wall in other parks go for home runs. With some expansion of the box seat area and the removal of significant foul territory, the ballpark has become more neutral, favoring neither pitchers nor hitters. Baseball-Reference's Park Factor measurement of 102 for the 2006 and 2007 seasons is evidence of this. Although the distance to center field has been marked at 395 feet since 1973, it is still actually 400 feet (120 m) to center, as has been the case since 1969. The two 395-foot signs erected in 1973 are to the left and right of dead center. However, curvature of the fence between the posted distance signs is not exactly radial from home plate, thus the distance from home plate directly to center field is most likely 5 feet farther than the posted 395 feet (120 m). 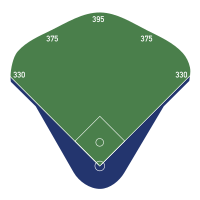 As of 2012, distance to center field is indicated 395 feet (120 m), and is located virtually exactly at the center field point. 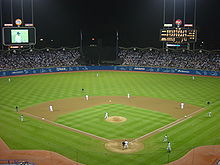 With the opening of Citi Field and the demolition of Shea Stadium in 2009, Dodger Stadium became the only stadium with symmetrical outfield dimensions remaining in the National League and only one of four total in Major League Baseball. 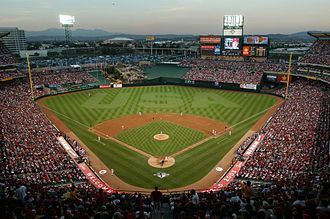 The other three symmetrical fields are Kansas City's Kauffman Stadium, Toronto's Rogers Centre, and Oakland–Alameda County Coliseum, all in the American League. The park's significant advantage was eroded somewhat since 1969, in general because MLB rules were changed after the "Year of the Pitcher" to lower the maximum height of the pitcher's mound, and more specifically because the Dodgers moved the diamond about 10 feet (3 m) towards center field. This also gave the fielders more room to catch foul balls, so there was some tradeoff. 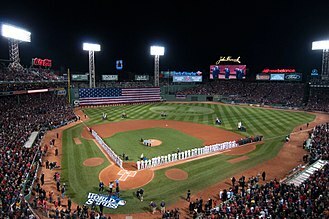 Following the 2004 season, the stadium underwent a renovation which significantly reduced the amount of foul territory. Seats were added which were closer to home plate than the pitcher's mound, the dugouts were moved 20 feet closer to the field, and previously open space down the foul lines was filled with new seats. The Dodgers won the 1963 World Series over the New York Yankees, sweeping the Yankees by winning game 4 by a score of 2-1. Through the 2018 season, this remains the only time the Dodgers ever clinched a World Series at home. Until 1988, Dodger Stadium had never hosted a seventh game of a postseason series. The Dodgers won Game 7 of the 1988 National League Championship Series over the New York Mets, 6-0. Five home runs have been hit completely out of Dodger Stadium. Outfielder Willie Stargell of the Pittsburgh Pirates hit two of those home runs. Stargell hit a 507-foot home run off the Dodgers' Alan Foster on August 6, 1969 that completely cleared the right field pavilion and struck a bus parked outside the stadium. Stargell then hit a 470-foot home run off Andy Messersmith on May 8, 1973 that landed on the right field pavilion roof and bounced into the parking lot. Dodger catcher Mike Piazza hit a 478-foot home run off Frank Castillo of the Colorado Rockies on September 21, 1997 that landed on the left field pavilion roof and skipped under the left field video board and into the parking lot. On May 22, 1999, St. Louis Cardinals first baseman Mark McGwire cleared the left field pavilion with a 483-foot home run off the Dodgers' Jamie Arnold and most recently, on May 12, 2015, Giancarlo Stanton of the Miami Marlins hit a 478-foot home run over the left-field roof off Mike Bolsinger. Dodger Stadium hosts the 2009 World Baseball Classic. The top of a ten-story elevator shaft bears the World Baseball Classic logo. Dodger Stadium upper seating on 6/15/18 vs. the San Francisco Giants. Dodger Stadium has also staged other sporting events such as boxing, a basketball game featuring the Harlem Globetrotters and a ski-jumping exhibition, as well as the baseball competition of the 1984 Summer Olympic Games and is currently designated to host softball and baseball for the 2028 Olympic Games with Angel Stadium. In 1992, baseball games from April 30 to May 3 were postponed due to the 1992 Los Angeles riots. Three consecutive days of double headers were held later in the season. Dodger Stadium hosted a soccer doubleheader on August 3, 2013, part of the 2013 International Champions Cup, featuring Real Madrid of Spain, Everton of England, Juventus of Italy and Los Angeles Galaxy of Major League Soccer in a tournament semifinal. 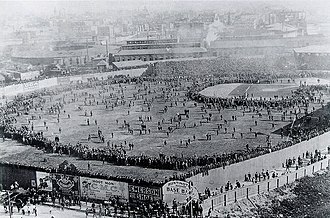 The field dimensions were from the third base side to right field; temporary grass was covered on the pitcher's mound and the infield. The tournament was a semifinal and Real Madrid defeated Everton 2-1 and Los Angeles Galaxy defeated Juventus 3-1. Dodger Stadium hosted its first ever National Hockey League game between the Los Angeles Kings and the Anaheim Ducks on January 25, 2014 as a part of the 2014 NHL Stadium Series. The Ducks won the game 3-0 in front of 54,099 fans. In addition rock band KISS played songs before and during intermission of the event. On March 21, 1963, Ultiminio "Sugar" Ramos won the WBC and WBA featherweight titles from Davey Moore in ten rounds. Moore died days after this fight. Also on the card, Roberto Cruz KO'd Raymundo "Battling" Torres in one round to win the WBA Junior Welterweight title. On November 15, 2015, Dodger Stadium hosted the third and final game of the Cricket All-Stars Series 2015, featuring many retired cricket players from around the world and led by great cricket legends Sachin Tendulkar and Shane Warne. Warne's Warriors defeated Sachin's Blasters by 4 wickets to win the series 3-0. The ends were named after Sandy Koufax and Don Sutton, two Hall of Fame pitchers for LA Dodgers. The stadium hosted the opening ceremony of the 1991 U.S. Olympic Festival. During the 2028 Summer Olympics, the stadium will host Baseball and Softball. Many of the world's top rock, pop and electronic bands have performed at Dodger Stadium, including acts such as The Cure, KISS, The Rolling Stones, The Beatles, Bee Gees, Elton John (2 Nights), Simon and Garfunkel, David Bowie, Madonna, Beyonce, Genesis, Eric Clapton, Depeche Mode (2 Nights), U2 (2 Nights), Dave Matthews Band, Bruce Springsteen and the E Street Band, Dead & Company, and Michael Jackson in 1984 with The Jacksons (6 concerts, 360,000 people). In July 2017, it hosted the Classic West concert, the first night had featured The Eagles (in their full first concert after the death of January 18th, 2016 founding member Glenn Frey) his place has been taken by his son Deacon Frey and American country artist Vince Gill, with supporting acts The Doobie Brothers and Steely Dan. The second night featured Earth, Wind & Fire, Journey, and Fleetwood Mac. Fleetwood Mac's music video for the song "Tusk" was recorded and filmed at the empty stadium in 1979. The ending of the 1985 film Better Off Dead takes place at Dodger Stadium. This was the starting point of a popular reality show, The Amazing Race in its fourth season. The parking lot of Dodger Stadium was used in the 2001 movie The Fast and the Furious, in which Brian O'Conner (played by actor Paul Walker) drifts his 1995 Mitsubishi Eclipse around the parking lot. Dodger Stadium was used as the model for Metropolis's baseball stadium in the 2006 film Superman Returns. 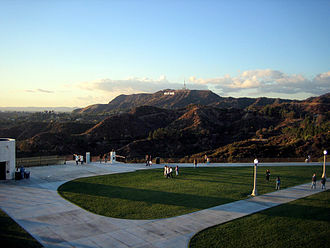 The end of the airplane rescue scene was filmed at Dodger Stadium, and a CGI backdrop for the city was added behind the outfield. The stadium also appeared in the 2003 film The Core during the scene where the space shuttle takes an unexpected crash landing. In a scene from the 2007 film Transformers, an empty Dodger Stadium is depicted being hit by the Autobot Jazz's protoform, which crashes through the upper deck and lands in the outfield. Though empty, the stadium's lights are on. In the closing scene of the 2012 film Rock of Ages, Dodger Stadium is seen hosting a concert for the rock band Arsenal, fronted by Stacee Jaxx (played by Tom Cruise). Pope John Paul II celebrated Mass at Dodger Stadium on September 16, 1987. Greg Laurie held his Harvest Crusades at Dodger Stadium in 2011 and 2012. Dodger Stadium can be reached by the Los Angeles Metro Transit Authority which operates two Dodger Stadium Express routes that transports fans to and from the Stadium during home games. The service is operated using funding from the Mobile Source Air Pollution Reduction Review Committee and Metro ExpressLanes. Buses on the Union Station route run non-stop between Union Station and Dodger Stadium. Service to the stadium begins operating 90 minutes before the start of the game, with departures every 10 minutes until the 3rd Inning. Buses stop at Center Field and Top Deck. Return service continues until 45 minutes after the final out or 20 minutes after post-game events, with buses departing as they fill. 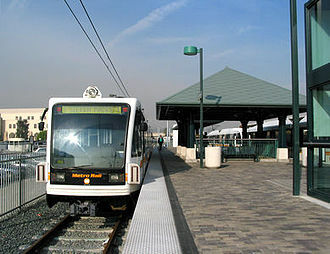 Buses on the South Bay route operate between the South Bay and Dodger Stadium along the Harbor Transitway, making stops at Slauson, Manchester, Harbor Freeway, Rosecrans, and Harbor Gateway Transit Center. Service to the stadium begins operating 2 hours before the start of the game, with departures every 20 minutes until the start of the game. Buses stop at Right Field. Return service begins at the end of the 7th inning and continues until 45 minutes after the final out or 20 minutes after post-game events, with buses departing as they fill. ^ "Dodger Stadium History". Dodgers.com. Retrieved 19 November 2014. 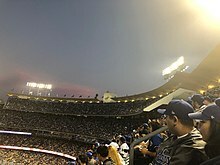 ^ "Dodger Stadium's New Signage Creates "Blue Heaven" Atmosphere". SignWeb.com. Retrieved 19 November 2014. ^ Gurnick, Ken (January 29, 2016). 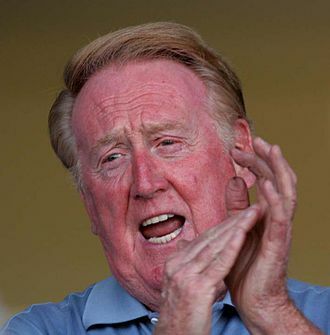 "Road to Dodger Stadium to be renamed Vin Scully Avenue". Major League Baseball Advanced Media. Retrieved January 31, 2016. ^ Dilbeck, Steve (January 29, 2016). "Council votes unanimously to rename street Vin Scully Avenue". Los Angeles Times. Retrieved January 31, 2016. ^ "Dodger Stadium Express". Major League Baseball Advanced Media. Retrieved February 16, 2014. ^ a b "2014 Dodger Season Tickets Go on Sale" (Press release). Major League Baseball Advanced Media. September 12, 2013. Retrieved October 5, 2013. ^ a b "Dodger Stadium Construction Facts". O'Malley Seidler Partners. Retrieved 24 April 2017. ^ Frueholz, Gary (10 June 2004). "Dodger Stadium: Alhambra's Connection to Dodger Stadium" (PDF). Dilbeck Real Estate. Retrieved 24 April 2017. ^ "Map--Diagram of proposed Dodger Stadium in Chavez Ravine – 1957." Los Angeles Examiner, 23 September 1957. http://digitallibrary.usc.edu/cdm/ref/collection/p15799coll44/id/91758 Retrieved October 16, 2013. 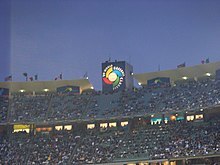 ^ "Daktronics on Display at Dodger Stadium". All Business. ^ Hernandez, Dylan; Shaikin, Bill (April 25, 2008). 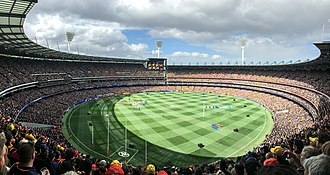 "Stadium Makeover Is Unveiled". Los Angeles Times. Retrieved August 14, 2013. ^ Roderick, Kevin (November 2, 2009). "Dodger Stadium Work on Hold". LA Observed. Retrieved August 14, 2013. ^ Bloom, Barry M. (May 12, 2005). "Dodgers to Stay in Place for 25 Years". Major League Baseball Advanced Media. Retrieved August 14, 2013. ^ Zavis, Alexandra (October 8, 2008). "'Dodgertown' Could Be Home Base". Los Angeles Times. Retrieved August 14, 2013. ^ Maddaus, Gene (August 6, 2012). "Dodgers Hire Janet Marie Smith, Star Stadium Designer, To Renovate Dodger Stadium". LA Weekly. Retrieved August 6, 2012. ^ Smith is best known as the driving force behind the massively influential Oriole Park at Camden Yards. She is also responsible for Turner Field in Atlanta and the most recent renovations at Fenway Park. ^ "Not Everyone Shares Roger Goodell's Positive Sentiments Regarding L.A. Stadium Situation". Yahoo! Sports. March 19, 2013. Retrieved March 21, 2013. ^ "Dodger Stadium Renovation Details". TrueBlueLA. January 8, 2013. Retrieved August 17, 2013. ^ "2014 Dodger Stadium renovations: The secret of their access". January 7, 2014. Retrieved February 15, 2015. ^ Kramer, Daniel. "MLB celebrates Jackie Robinson Day". MLB.com. Retrieved 20 April 2017. ^ Masters, Nathan. "Chavez Ravine: Community to Controversial Real Estate". KCET. KCETLink Media Group. Archived from the original on 3 August 2017. Retrieved 3 August 2017. ^ a b "Dodger Stadium". Baseball Statistics. Retrieved August 14, 2013. ^ "Dodger Stadium rainouts are very rare". Retrieved April 7, 2015. ^ a b Lowry, Phillip (2005). Green Cathedrals. New York City: Walker & Company. ISBN 0-8027-1562-1. ^ Paulas, Rick (18 May 2011). "An MLB guide to all you can eat". ESPN. Retrieved 8 July 2014. ^ Shaikin, Bill (August 10, 2013). "Dodgers take aim at 4-million home attendance". Los Angeles Times. ^ Los Angeles Dodgers [@Dodgers] (13 September 2013). "Tonight's crowd of 53,393 represented the largest paid attendance in @MLB this season and was the #Dodgers 24th sellout of 2013. Thank you" (Tweet) – via Twitter. ^ Montano, Al (July 25, 2013). "Cincinnati 5, Dodgers 2: Reds Cool Off L.A." Los Angeles Daily News. Retrieved July 25, 2013. ^ "2013 Los Angeles Dodgers Media Guide". Major League Baseball Advanced Media. p. 1. Retrieved October 5, 2013. ^ Shaikin, Bill (July 22, 2010). "Dodgers' Attendance Isn't Always What It Seems". Los Angeles Times. Retrieved October 5, 2013. ^ "MLB Park Factors". ESPN. Retrieved August 14, 2013. ^ "Giancarlo Stanton hits a ball out of Dodger Stadium". New York Post. May 12, 2015. Retrieved 13 May 2015. ^ Callis, Tracy; Johnston, Chuck. 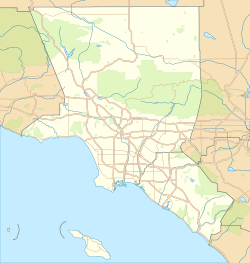 Boxing in the Los Angeles Area [1880-2005]. Bloomington, Indiana: Trafford Publishing. 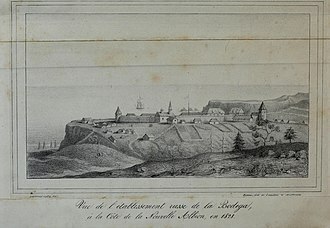 p. 123. ISBN 9781426916885. Retrieved January 28, 2018. 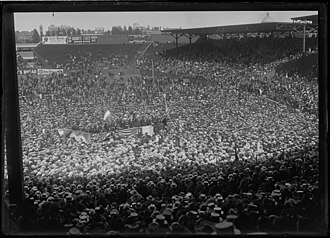 Wikimedia Commons has media related to Dodger Stadium. 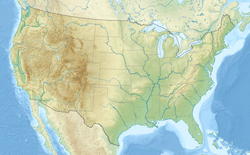 Founded in 1971 to take over most of the remaining U. S. passenger rail services, it is partially government funded yet operated and managed as a for-profit corporation. Amtrak serves more than 500 destinations in 46 states and three Canadian provinces, operating more than 300 trains each day over 21,300 miles of track, some track sections allow trains to run as fast as 150 mph. In fiscal year 2015, Amtrak served 30.8 million passengers and had $2.185 billion in revenue, nearly two-thirds of passengers come from the 10 largest metropolitan areas, 83% of passengers travel on routes shorter than 400 miles. Its headquarters is at Union Station in Washington, D. C, the name Amtrak is a portmanteau of the words America and trak, the latter itself a sensational spelling of track. 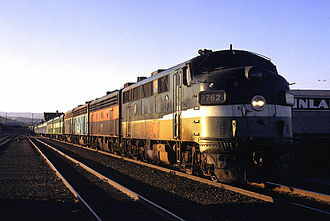 From the mid-19th century until about 1920, nearly all intercity travelers in the United States moved by rail, historically, U. S. passenger trains were owned and operated by the same privately owned companies that operated freight trains. About 65,000 railroad passenger cars operated in 1929, from 1920 into the 20th century, passenger rails popularity diminished and there was a series of pullbacks and tentative recoveries. Rail passenger revenues declined dramatically between 1920 and 1934 because of the rise of the automobile, in the same period, many travelers were lost to interstate bus companies such as Greyhound Lines. However, in the mid-1930s, railroads reignited popular imagination with service improvements and new, diesel-powered streamliners, such as the gleaming silver Pioneer Zephyr and Flying Yankee. Even with the improvements, on a basis, traffic continued to decline. World War II broke the malaise, passenger traffic soared sixfold thanks to troop movements, in 1946, there remained 45 percent fewer passenger trains than in 1929, and the decline quickened despite railroad optimism. Passengers disappeared and so did trains, few trains generated profits, most produced losses. Broad-based passenger rail deficits appeared as early as 1948, and by the mid-1950s, by 1965, only 10,000 rail passenger cars were in operation,85 percent fewer than in 1929. The Los Angeles Dodgers are an American professional baseball team based in Los Angeles, California. The Dodgers compete in Major League Baseball as a club of the National League West division. Established in 1883 in Brooklyn, New York, the moved to Los Angeles before the 1958 season. They played for four seasons at the Los Angeles Memorial Coliseum before moving to their current home of Dodger Stadium in 1962, the Dodgers as a franchise have won six World Series titles and 21 National League pennants. 11 NL MVP award winners have played for the Dodgers, winning a total of 13 MVP Awards, Eight Cy Young Award winners have pitched for the Dodgers, winning a total of twelve Cy Young Awards. The team has produced 17 Rookie of the Year Award winners, including four consecutive from 1979 to 1982 and five consecutive from 1992 to 1996. In the 20th century, the team, known as the Robins, won pennants in 1916 and 1920. In the 1930s, the changed its name to the Dodgers. In 1941, the Dodgers captured their third National League pennant and this marked the onset of the Dodgers–Yankees rivalry, as the Dodgers would face them in their next six World Series appearances. Both leagues currently have 15 teams. The two league champions of 1903 arranged to compete against each other in the inaugural World Series, after the 1904 champions failed to reach a similar agreement, the two leagues formalized the World Series as an arrangement between the leagues. National League teams have won 48 of the 112 World Series contested from 1903 to 2016, the 2016 National League champions are the Chicago Cubs. By 1875, the National Association of Professional Base Ball Players was dangerously weak, Hulbert had a problem—five of his star players were threatened with expulsion from the NAPBBP because Hulbert had signed them to his club using what were considered questionable means. Hulbert had a vested interest in creating his own league. 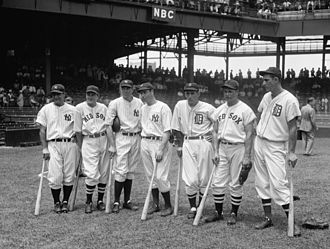 After recruiting St. Louis privately, four western clubs met in Louisville, Boston Red Stockings, the dominant team in the N. A. Hartford Dark Blues from the N. A. Mutual of New York from the N. A. St. Louis Brown Stockings from the N. A, the only strong club from 1875 excluded in 1876 was a second one in Philadelphia, often called the White Stockings or Phillies. The first game in National League history was played on April 22,1876, at Philadelphias Jefferson Street Grounds, 25th & Jefferson, the new leagues authority was tested after the first season. The National League operated with six clubs during 1877 and 1878, over the next several years, various teams joined and left the struggling league. 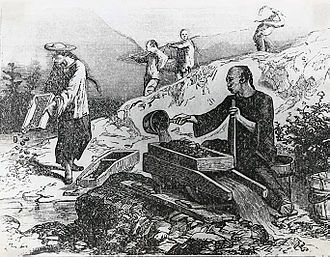 By 1880, six of the eight members had folded. The two remaining original NL franchises and Chicago, remain in operation today as the Atlanta Braves, in 1883 the New York Gothams and Philadelphia Phillies began National League play. 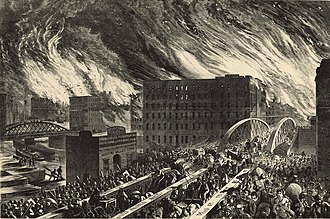 Both teams remain in the NL today, the Phillies in their original city, the NL encountered its first strong rival organization when the American Association began play in 1882. The A. A. played in cities where the NL did not have teams, offered Sunday games and alcoholic beverages in locales where permitted, the National League and the American Association participated in a version of the World Series seven times during their ten-year coexistence. Vincent Edward Vin Scully is a retired American sportscaster. He retired in 2016, ending his run as their play-by-play announcer. In his final season behind the microphone, Scully announced most Dodger home games on SportsNet LA television and he is known for his dulcet voice, lyrically descriptive style, and signature introduction to Dodger games, Its time for Dodger baseball. Hi, and a pleasant good to you. He is considered by many to be the greatest baseball broadcaster of all time, according to fan rankings, Bleacher Report, born in The Bronx, Scully grew up in the Washington Heights section of Manhattan. He worked delivering beer and mail, pushing garment racks, and his father Vincent Aloysius was a silk salesman, his mother Bridget was a Roman Catholic homemaker of Irish descent from whom her son inherited his red hair. His biological father died of pneumonia when Scully was 4 and his mother married an English merchant sailor named Allan Reeve. Scully attended high school at the Fordham Preparatory School in The Bronx. Scully discovered his love of baseball at age 8 when he saw the results of the game of the 1936 World Series at a laundromat. Since Scully lived near the Polo Grounds and because he was a member of the PAL and CYO, he was able to attend games for free. Scully decided at eight years old that he wanted to become a sports announcer when he became fascinated with the broadcasts on the radio. After serving in the United States Navy for two years, Scully began his career as a student broadcaster and journalist at Fordham University and he received only one response, from CBS Radio affiliate WTOP in Washington, D. C. which made him a fill-in. Scully was recruited by Red Barber, the director of the CBS Radio Network. Expecting an enclosed box, Scully had left his coat and gloves at his hotel. Barber mentored Scully and told him if he wanted to be a successful sports announcer he should never be a homer, never listen to other announcers. In 1950, Scully joined Red Barber and Connie Desmond in the Brooklyn Dodgers radio, when Barber got into a salary dispute with World Series sponsor Gillette in 1953, Scully took Barbers spot for the 1953 World Series. The dollar sign is a symbol primarily used to indicate the various units of currency around the world. The symbol can interchangeably have one or two vertical strokes, note that the two-stroked version is not the same symbol as the cifrão. In common usage, the sign appears to the left of the amount specified, the best documented explanation holds that the sign evolved out of the Spanish and Spanish American scribal abbreviation pˢ for pesos. A study of late eighteenth- and early nineteenth-century manuscripts shows that the s gradually came to be written over the p, a variation, though less plausible, of this hypothesis derives the sign from a combination of the Greek character psi and S. There are a number of hypotheses about the origin of the symbol, some with a measure of academic acceptance. Kingdom of Sicily Denaro minted in the Kingdom in Sicily at least by 1258–1266 had what could be construed as a dollar symbol. These coins were widely circulated due to the Crusades – and specifically the Crusade that targeted Tunis, several alternative hypotheses relate specifically to the dollar sign drawn with two vertical lines. 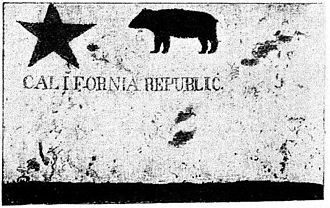 A common hypothesis holds that the sign derives from the Spanish coat of arms, in 1492, Ferdinand II of Aragon adopted the symbol of the Pillars of Hercules and added the Latin warning Non plus ultra meaning nothing further beyond, indicating this is the end of the world. But when Christopher Columbus came to America, the legend was changed to Plus ultra, the Pillars of Hercules wrapped in a banner thus became a symbol of the New World. In this example the right-hand pillar clearly resembles the dollar sign, the symbol was adopted by Charles V and was part of his coat of arms representing Spains American possessions. The symbol was stamped on coins minted in gold and silver, the coin, known as Spanish dollar, was the first global currency used in the entire world since the Spanish Empire was the first global Empire. These coins, depicting the pillars over two hemispheres and a small S-shaped ribbon around each, were spread throughout America and Asia. According to this, traders wrote signs that, instead of saying Spanish dollar, had this made by hand. 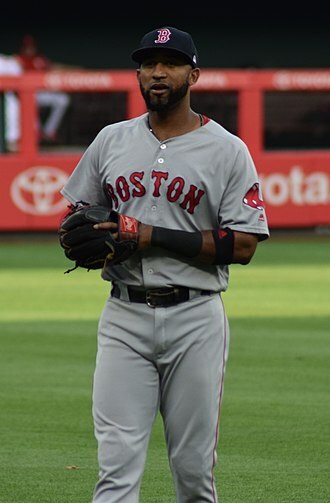 The World Series is the annual championship series of Major League Baseball in North America, contested since 1903 between the American League champion team and the National League champion team. The winner of the World Series championship is determined through a playoff. As the series is played in October, during the season in North America. As of 2016, the World Series has been contested 112 times, with the AL winning 64, the 2016 World Series took place between the Cleveland Indians and the Chicago Cubs. Seven games were played, with the Cubs victorious after game seven, the final score was 8–7, the game went into extra innings after a tied score of 6–6. This was the third World Series won by the Cubs, as well as their first title since 1908, in the National League, the St. As of 2016, no team has won consecutive World Series championships since the New York Yankees in 1998,1999, all championships were awarded to the team with the best record at the end of the season, without a postseason series being played. From 1884 to 1890, the National League and the American Association faced each other in a series of games at the end of the season to determine an overall champion. These series were disorganized in comparison to the modern World Series, the number of games played ranged from as few as three in 1884, to a high of fifteen in 1887. Both the 1885 and 1890 Series ended in ties, each team having won three games with one tie game, the series was promoted and referred to as The Championship of the United States, Worlds Championship Series, or Worlds Series for short. In his book Krakatoa, The Day the World Exploded, August 27,1883, Simon Winchester mentions in passing that the World Series was named for the New York World newspaper, but this view is disputed. Until about 1960, some sources treated the 19th-century Series on a basis with the post-19th-century series. After about 1930, many authorities list the start of the World Series in 1903, following the collapse of the American Association after the 1891 season, the National League was again the only major league. Metro Purple Line train at Union Station. The Metro Red and Purple lines both end at Union Station, the eastern terminus of both lines. This elevated section of the Harbor Transitway carries the Metro Silver Line and the Metro ExpressLanes over the frequently congested Harbor Freeway. SunTrust Park, the newest ballpark in Major League Baseball. 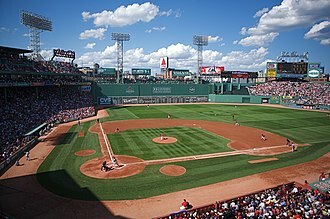 Fenway Park is the oldest active ballpark in Major League Baseball. The famed Green Monster is the left-field fence. Camden Yards started the nostalgic craze with a smaller, redbrick and forest-green stadium. 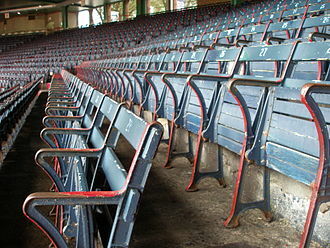 The old wooden seats of Fenway's Grandstand section. A F-16 Fighting Falcon flies past Dodger Stadium during the pre-game ceremonial flyover before Game 2. Clayton Kershaw pitched seven innings with 11 strikeouts in winning Game 1. George Springer drove in the game-winning run in Game 2. Lance McCullers Jr. earned the win in Game 3. Silver 8 real coin of Philip V of Spain, 1739 - This earlier example pre-dates other explanations by at least 30 years. Nolan Ryan holds the record for no-hitters in the major leagues with seven. 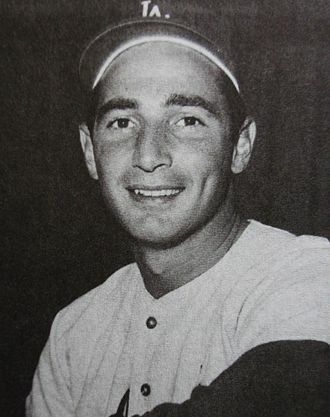 Hall of Famer Sandy Koufax threw four no-hitters, including one perfect game, in his major-league career. Shea Stadium prior to the start of a New York Mets game in 2008. Shea had the best attendance in the National League that year, garnering over 53,000 fans per game on average.